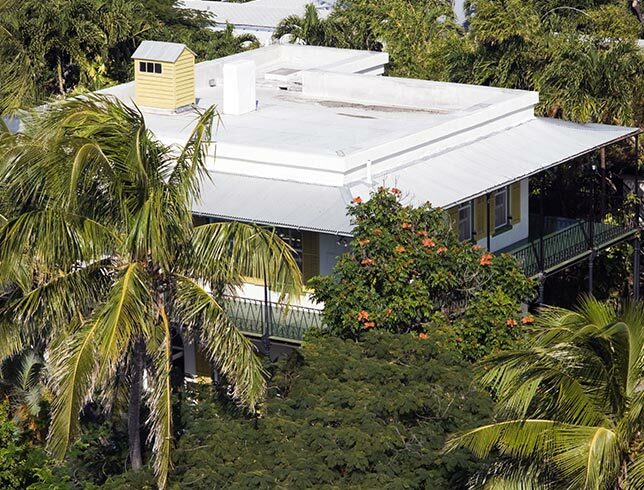 Stop at the most significant address in Key West, Florida, and wander through the illustrious home and lush gardens of the Nobel Prize author, Ernest Hemingway. Take a guided tour of the Spanish Colonial house that Hemingway resided in during the 1930's, ornately decorated with furniture from Spain from the 17th and 18th-centuries. Get an inside peek of the life he led in the Keys for over ten years writing and enjoying the tiny island. Now a National Historic Landmark, this unique property is also home to 40-50 cats, all descendants of Hemingway's cat, Snow White. After the tour, make your way to the museum and bookstore for Hemingway keepsakes, books, and novelty items on sale. Adults: $14.00, Children (6 - 12): $6, Children (5 and under): Free. Cash Only. Open daily from 9 am to 5pm, rain or shine. Can we see the Earnest Hemingway House six toed cats? Yes, all of the 40-50 cats living at the Hemingway house are polydactyl (six-toed) cats, although only about half actually have six toes. The other cats have it in their DNA making it possible for them to keep passing the gene down the line. All of the cats are decedents of Hemingway’s original polydactyl cat, Snow White. They live happily at the Hemingway House with adoring caregivers and donations from Revolution and Purr-fect Fence. How can we take an Earnest Hemingway House tour? Taking a tour of the prized author’s former home is easy as no reservations are required. Just arrive at the property between 9 am and 4:30 pm any day of the week and take a 30-minute guided tour of the house interior, the gardens, and inviting pool area. You can then shop in the bookstore or stroll around the museum at your leisure for a glimpse inside Hemingway's life.